The original drink appears in Trader Vic’s Bartenders Guide from 1972 and is sometimes referred to as the Floridita Cocktail. The La Florida Cocktail is the creation of Constantine Ribailagualt and was one of the signature drinks of the La Florida bar in Havana, Cuba. It’s name is strikingly similar to the Floridita Daiquiri but they are two different drinks. The daiquiri contains maraschino liqueur while the cocktail uses crème de cacao, sweet vermouth, and grenadine as the sweeteners. 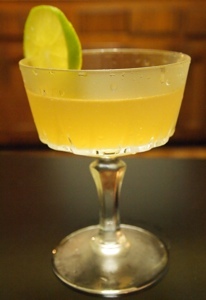 This particular version of the drink appears in the PDT cocktail book and is the creation of Jack McGarry. Shake with ice and strain into a chilled cocktail glass. Garnish with a lime wheel and enjoy. The drink is well put together and despite the .5 oz of Crème de Cacao the chocolate flavor is still subtle and interwoven with the herbal qualities of the vermouth. The final flavor is not one you would except but its delicious and well worth exploring.